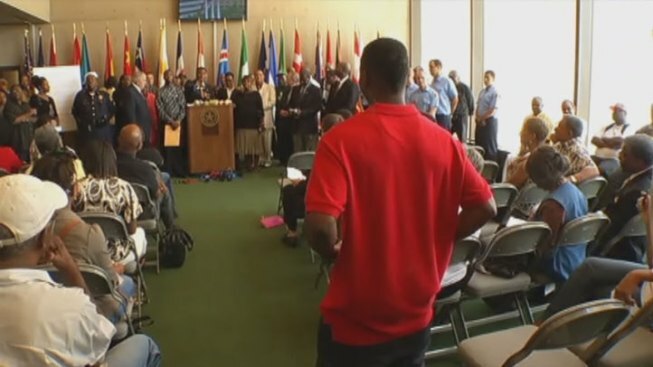 A Dallas councilman says pants are still sagging and he's rolling out another push to get people to "pull 'em up." Councilman Dwaine Caraway attracted national attention a few years ago when he first asked men to quit showing their underwear with low-hanging pants. Some publicity was not positive. President Barack Obama gave Caraway heat, saying city leaders should have other things to worry about. But on Wednesday, Caraway had a response for the president and his daughters. "Tasha and Malia [Obama] -- they don't ride the DART bus here in Dallas, and they have Secret Service," he said. "And they're not walking through Walmart over on Wheatland dealing with these issues on a daily basis." Caraway had support this time from most of the City Council and dozens of other city leaders at a press conference Wednesday to announce his campaign. He said sagging pants are disrespectful to women. Caraway also said exposed underwear could even be a health hazard on Dallas Area Rapid Transit bus seats and in food stores. "When they take care of that uncomfortable moment, they will be touching on the grapes, the apples, the lemons and everything else," Caraway said. Men who wore their pants low in downtown Dallas on Wednesday said it's a matter of style and comfort that is not harmful to anyone. "You know, this is the new generation; people got to understand," DART passenger Daroius Favors said. Chris Anderson, another passenger, said buses have far more offensive passengers. "A lot of people get on the bus [smelling] like piss and be musty," he said. "What they going to do about that?" Most of the men with sagging pants also wore long shirts that covered their midsection. "There's plenty of girls out there with their short dresses, showing more body than what we're showing," Anderson said. Caraway and his supporters also said women should also show more respect with their clothing. Councilwoman Carolyn Davis said women can help end sagging by telling guys to pull their pants up. "Ladies, we have to stop it," she said. "They only do it because we accept it." Caraway is asking DART to adopt a policy similar to Fort Worth's The T, which does not allow people with exposed underwear to ride the bus. He said donated billboards would once again carry a "pull 'em up" message. And signs would be printed for stores willing to forbid sagging customers. Caraway also plans a June 23 "Sagging Summit" to include former Dallas Cowboy Deion Sanders. "It's imperative that this issue is addressed as we continue to grow our city," Caraway said.